Las Vegas is known as the adult playground where gambling, dining and entertainment are second to none. However, when it comes to booking your group golf outing, the last thing you want to do is take a gamble on the company you entrust to handle your questions, get course recommendations and handle your reservations and tee times. Here are 6 important factors to consider before booking. 1) Is the company reputable? Do they offer (real) referrals? Even though your trip may feel more like a vacation or break from your business or convention schedule, it’s oftentimes easy to get distracted and let your guard down when looking for a company to book your golf getaway. 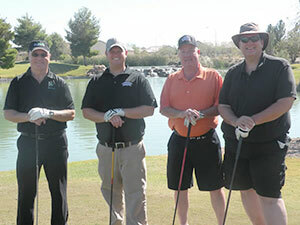 Sterling Golf Services has more than 20 years of golf experience in Las Vegas. It’s important you do your homework and check references. Many websites will showcase ‘glowing’ testimonials and positive feedback. But, do they offer you multiple referrals you can actually contact to get an honest opinion? We don’t put bogus or enhanced testimonials on our website. To us, the proof is in the pudding and we have a list of references and referrals you can check with. Service is very important to us and our dedication to details and availability has kept our clients coming back to us for years. 2) Does the company you’re working with know the golf courses in Las Vegas? Sterling Golf Services is locally owned and unlike some of our competitors, we are Las Vegas area residents who play the courses you are booking. Other companies are based outside of Nevada and have limited “first hand” knowledge of the courses, seasons and current conditions. Secondly, we’re golfers ourselves and actually play all the courses in Southern Nevada. We don’t sit behind a desk every day and not have intimate knowledge of the courses. Having this as a reference is an absolute must when finding the best course for your group. To see a perfect example of how local knowledge of a golf course can help you enjoy your golfing experience click here – and help you play at the US Open if you’re Justin Rose. Some companies will refer courses regardless of course conditions. Even if it’s the lowest price, you will not have a great experience. This is why it’s important to have an actual presence in Las Vegas who know the current conditions of all the courses. Most companies will charge you immediately upon booking no matter how far in advance. This can present several issues. We know things come up or plans change so we make it easy for our clients. We do not charge you until the cancellation period date is reached – usually 48-72 hours in advance. If you need to make any changes, simply contact us and we’ll be happy to take care of you for no additional fees. 5) How committed are they to service? One of the biggest complaints we hear from new clients coming to us from other companies is frustration over their lack of service and communication. What if you have a Sunday morning tee time and there’s an issue with your reservation? Is there someone you can call and actually speak with to help you? We are available from 7 am – 7 pm everyday to help you. Whether you need help picking out a couple courses to play while you’re in town or adding another player to your roster the morning-of, we’ve got you covered. This is an over-the-top (and humorous) example of bad customer service but it drives the point home of how important good service is and how much it means to us. Customer service is our top priority and one we take very seriously. 6) Does the company offer extra amenities to help you have a better experience? Playing golf in Las Vegas is great – but what about the rest of the time you’re here. Whether you’re a first-time or frequent visitor, you may need someone to turn to find all the best things to do and places to visit while you’re in town. On top of that, can they offer you discounts to help save some money while you’re here? Sterling Golf Services is the complete package when it comes to your golf group trip. Our intimate knowledge of the courses along with unmatched customer service translates to a better experience for you. Call us toll-free at (877) 889-4653 or fill out our 30 second form for a free quote. Find out how to get the best deal for your next Las Vegas golfing trip.